For other people named Anthony Rizzo, see Anthony Rizzo (disambiguation). 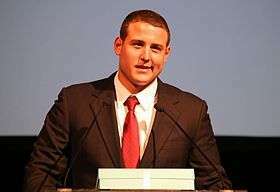 Anthony Vincent Rizzo (born August 8, 1989) is an Italian-American professional baseball first baseman for the Chicago Cubs of Major League Baseball (MLB). He is a three-time All-Star. Rizzo was selected by the Boston Red Sox in the sixth round of the 2007 MLB draft and became a top minor league prospect in the Red Sox organization. He was traded to the San Diego Padres after the 2010 season along with three other prospects in exchange for All-Star first baseman Adrian Gonzalez. After being traded to the Cubs in 2012, he developed into an All-Star player. Rizzo was a sixth-round draft choice out of Marjory Stoneman Douglas High School in Parkland, Florida in the 2007 Major League Baseball draft by the Red Sox. He was heading for Florida Atlantic University before he was drafted and signed with a $325,000 signing bonus. He played in the Red Sox organization with the Gulf Coast League Red Sox, Greenville Drive, Salem Red Sox and the Portland Sea Dogs. Rizzo hit 12 home runs in 2009. In 2010, he hit a combined .260 with an on-base percentage (OBP) of .334 and a slugging percentage (SLG) of .480 along with 42 doubles, 25 home runs and 100 RBIs between stops at High-A Salem and Double-A Portland. He credited the easing of his swing and making better use of his legs for his power surge. On December 6, 2010, Rizzo was traded along with Casey Kelly, Reymond Fuentes, and Eric Patterson to the Padres for three-time All-Star first baseman Adrian Gonzalez. Rizzo was considered the third best prospect (Kelly was #1) and the best power-hitting prospect in the Red Sox organization. Kevin Boles, Rizzo's manager at Salem, also previously managed Gonzalez in the minors. Boles said, "Rizzo reminds me a lot of Adrian Gonzalez ... Rizzo is a bigger kid and has a little more power, Adrian is a little more of a contact hitter, but they had very similar styles of play ... We thought very highly of Anthony Rizzo. He's going to be a heck of a player.'" Padres General Manager Jed Hoyer expected either Rizzo or Kyle Blanks to eventually be the Padres major league starting first baseman. The Padres invited Rizzo as a non-roster player to their major league camp for 2011 Spring training. He started the 2011 season in Triple-A with the Tucson Padres. In his first 15 games, Rizzo hit .452 with six home runs and 24 RBIs. In May 2011, The San Diego Union-Tribune wrote that Rizzo's debut in the Major Leagues might be delayed by the Padres despite the club's hitting deficiencies due to cost considerations created by the "Super Two" exception for salary arbitration eligibility. The team cited Rizzo's lack of experience above Double-A and his limited exposure to left-handed pitching as benefits of his continuing to play in Tucson. He was called up to the majors after hitting .365 with an OPS of 1.159 along with 16 homers and 63 RBI in 200 at-bats over 52 games in Tucson. The San Diego Union-Tribune called Rizzo "the most celebrated Padres call-up" since Roberto Alomar debuted with the team in 1988. Rizzo's promotion was prompted by the Padres' inadequate offensive production and fielding play of veterans at first base. In his debut on June 9, 2011, against the Washington Nationals, Rizzo struck out in his first at-bat, but then proceeded to hit a triple and score a run, helping the Padres to a 7–3 victory. He hit his first home run on June 11 against John Lannan. After three games he was 3-for-7 with a double, triple and a home run, while he demonstrated patience in drawing four walks for a .667 on-base percentage (OBP). On July 22, 2011 Rizzo was demoted back to Triple-A, and Blanks was promoted. Rizzo had struggled with only a .143 batting average and 1 home run, striking out 36 times in 98 at-bats. Hoyer said Rizzo "worked hard, never made excuses, and endeared himself to his teammates" during his initial stint in the majors. Rizzo was recalled to the majors on September 4 after finishing the season at Tucson batting .331 with 26 homers and 101 RBI in 93 games. He finished his first season in San Diego hitting only .141 with 46 strikeouts in 128 at-bats. Hoyer believed Rizzo would be the starting first baseman for the Padres in 2012 with Jesús Guzmán as the second option. However, Yonder Alonso moved ahead of Rizzo on the team's depth chart after he was acquired by the Padres in December 2011 in a trade for Mat Latos. On January 6, 2012, the Padres traded Rizzo and right-handed starting pitcher Zach Cates to the Chicago Cubs in exchange for right-handed starting pitcher Andrew Cashner and outfielder Kyung-Min Na. The deal was negotiated by Jed Hoyer, the Cubs' general manager. Hoyer had also drafted Rizzo while working as an assistant general manager for the Red Sox, and later acquired Rizzo while he was the Padres' general manager. He blamed himself for calling up Rizzo to the majors too early in San Diego. Rizzo started the 2012 season with the Triple-A Iowa Cubs. He again excelled in the minor leagues, batting .342 average with 23 home runs and 62 RBIs before being recalled by the Cubs on June 26. Similar to his call-up in San Diego, he was expected to help a struggling offense. He became the first player in Cubs history to have three game-winning RBIs in his first five games with the team. He hit seven homers in July, the most by a Cubs rookie in a calendar month since Mel Hall hit nine in August 1983. He also led National League (NL) rookies that month in homers, hits (32), RBIs (17) and total bases (55). He ranked second among NL rookies in runs scored (14), and he was third with a .330 batting average, .375 on-base percentage and .567 slugging percentage. He was named the league's July Rookie of the Month. On May 12, 2013, Rizzo agreed to a 7-year, $41 million deal. The deal included two club options that could extend the contract to 9 years and $73 million. He was named as the Cubs finalist for the national Heart and Hustle Award, and he was also named the Cubs finalist for the Roberto Clemente Award. Rizzo placed 2nd for the Gold Glove award for first basemen. 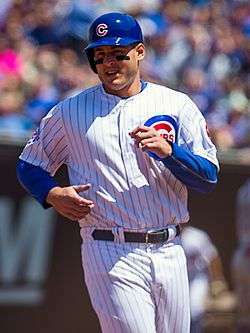 Despite having an off year in 2013, Rizzo showed good power, belting 23 homers and 40 doubles in 606 at bats with a .233 batting average. Rizzo had his fifth multi-homer game on May 31, and his second career walk-off home run on June 6. Rizzo was voted into the All-Star game via the final vote by fans along with White Sox pitcher Chris Sale. Rizzo joined teammate Starlin Castro in Minneapolis for the All-Star game. In late July, Rizzo won his first Player of the Week award. In mid-September Rizzo became the youngest player to receive the Branch Rickey Award as "a strong role model for young people". Rizzo finished the season with a combined on-base and slugging percentage of .913 (3rd in the NL), 32 HR's (2nd in the NL) and an at-bats per HR percentage of 16.4 (2nd in the NL) and placed 10th in the National League MVP voting. Rizzo was elected on the player's ballot for the 2015 All-Star Team. It made the second consecutive year he played in the game. He also competed in the 2015 Major League Baseball Home Run Derby for the first time in his career, but lost in the first round of the derby to Josh Donaldson. Rizzo hit his 100th career home run and 300th RBI on September 8, 2015, against Cardinals pitcher Michael Wacha. Rizzo was hit by a pitch 30 times in 2015 and joined Don Baylor as the only other member of the 30HR/30HBP club. Rizzo finished the regular season with a .278 batting average, 31 home runs, 38 doubles and 101 RBI in 701 plate appearances and placed 4th in National League MVP voting. Rizzo started as the first baseman at the 2016 All-Star game, receiving the most fan votes in the National League. By the end of the year, Rizzo had become one of the few players in Cub history to hit over 40 doubles and 30 home runs in the same year. Only three other players in the long history of the Cubs had achieved that feat. Rizzo was the first "lefty". Rizzo played in 155 games with 583 at bats and crossed the plate 94 times. He had 170 hits with 43 doubles, 4 triples, 32 home runs and 109 RBIs. He finished the year with a batting average of .292. Rizzo was one of six finalists for the Marvin Miller Man of the Year Award and was the Cubs nominee for the Roberto Clemente Award. After an extremely slow start in the 2016 postseason, Rizzo broke out of his slump and was an integral part of the last three victories over Los Angeles and led the Cubs to their first World Series appearance since 1945. In the 2016 World Series, Rizzo scored 7 runs and hit 5 RBIs, and helped the Cubs win their first World Series title since 1908. The Cubs player won the Esurance MLB Award for Best Social Media Personality and for Best Play: Defense. As his family originated in the Sicilian town of Ciminna, Rizzo chose to play for Italy in the 2013 World Baseball Classic before the MLB 2013 season. Rizzo has an older brother, John, who was a lineman for the Florida Atlantic University football team. Rizzo was diagnosed with limited state classical Hodgkin's lymphoma in April 2008. Rizzo went through chemotherapy for six months. His grandmother was battling breast cancer at the same time. On September 2, 2008, Rizzo's doctor told him he was in remission. He still had six weeks left of treatment and had some follow-up testing. On November 18, Rizzo's doctor told him he "could live a normal life." In 2012, The Anthony Rizzo Family Foundation began. It is a non-profit 501(c)(3) organization, benefiting cancer research and the families fighting the disease. The foundation is run entirely by Rizzo's family, his close friends and his management team. Rizzo provides oversight and leadership. 1 2 Center, Bill (June 9, 2011). "Pregame Preview: Rizzo debuts Thursday night at Petco Park". The San Diego Union-Tribune. Archived from the original on July 5, 2011. 1 2 3 Hutton, Ted (July 20, 2008). "Rizzo family battles on; DT interlude; Media Daze". Sun Sentinel. Archived from the original on February 22, 2011. 1 2 "Anthony Rizzo Minor League Statistics & History". baseball-reference.com. Retrieved February 14, 2011. 1 2 Norcross, Don (March 11, 2011). "Kelly and Rizzo off to impressive starts for Padres". San Diego Union-Tribune. Archived from the original on March 21, 2011. ↑ Drellich, Evan (December 6, 2010). "Gonzalez 'ready to beat the Yanks'". MLB.com. Archived from the original on February 14, 2011. ↑ Brock, Corey (December 16, 2010). "Patterson to Friars completes Gonzalez deal". MLB.com. Archived from the original on February 14, 2011. ↑ Center, Bill (December 6, 2010). "Gonzalez, Hoyer discuss Padres-Red Sox deal". The San Diego Union-Tribune. Archived from the original on February 14, 2011. ↑ Sullivan, Time (January 24, 2011). "Was the Gonzalez trade a good one? We'll let you know ... in about 2014". The San Diego Union-Tribune. Archived from the original on February 22, 2011. ↑ Center, Bill (December 23, 2010). "Who's on first? Padres close to signing Hawpe". The San Diego Union-Tribune. Archived from the original on February 14, 2010. ↑ Brock, Corey (January 6, 2011). "Kelly, Rizzo among 20 invited to Padres camp". MLB.com. Archived from the original on February 14, 2011. ↑ Brock, Corey (March 19, 2011). "Rizzo a smash in Minor League action". MLB. Archived from the original on March 31, 2011. 1 2 3 4 Norcross, Don (July 21, 2011). "Rizzo demoted after Padres finish Florida sweep". Archived from the original on July 22, 2011. ↑ Axisa, Mike. "Padres Designate Eric Patterson For Assignment". MLBTradeRumors.com. Retrieved June 9, 2011. 1 2 Jenkins, Chris (July 18, 2011). "Rizzo's "hard road" takes him home". The San Diego Union-Tribune. Archived from the original on July 20, 2011. ↑ Canepa, Nick (June 9, 2011). "Amid much hoopla, The Riz calmly contributes right away, as expected". The San Diego Union-Tribune. Archived from the original on July 5, 2011. ↑ "John Lannan pitches Nationals past Padres 2–1". The San Diego Union-Tribune. Associated Press. June 11, 2011. Archived from the original on July 5, 2011. ↑ "Struggling Padres prospect Anthony Rizzo demoted to minors with .143 average". ↑ Center, Bill (September 5, 2011). "Daily Update: Rizzo's at first, but Guzman's bat must play; notes, minors". The San Diego Union-Tribune. Archived from the original on September 14, 2011. ↑ Center, Bill (September 30, 2011). "Padres look to upgrade corner outfield spots, bullpen and bench for 2012". The San Diego Union-Tribune. Archived from the original on October 2, 2011. ↑ Center, Bill (December 17, 2011). "Latos traded to Reds for Volquez, 3 top prospects". The San Diego Union-Tribune. Archived from the original on December 17, 2011. ↑ Center, Bill (January 6, 2012). "Cashner key to Padres' deal with Cubs". The San Diego Union-Tribune. Archived from the original on January 6, 2012. 1 2 "Cubs recall 1B Rizzo from Triple-A Iowa". yahoo.com. Associated Press. June 26, 2012. Archived from the original on June 26, 2012. 1 2 Jenkins, Chris (August 6, 2012). "Cubs reaping Rizzo's returns". U-T San Diego. Archived from the original on August 8, 2012. ↑ Kruth, Cash (August 2, 2012). "Rizzo named NL's rookie of the month for July". MLB.com. Archived from the original on August 8, 2012. ↑ "Anthony Rizzo Family Foundation Home Page August 2015". Anthony Rizzo Family Foundation. Retrieved October 8, 2015. ↑ Rogers, Jesse. "Rizzo earns Player of the Week honors". ESPN Chicago. ESPN. Retrieved August 4, 2014. ↑ "Cubs 1B Anthony Rizzowins Branch Rickey Award". usatoday.com. usatoday. Retrieved September 18, 2014. ↑ "Appearances on Leader Boards, Awards, and Honors". baseball-reference.com. Baseball Reference. Retrieved September 18, 2015. ↑ "Baseball Awards Voting for 2015". Baseball Reference. Retrieved November 20, 2015. ↑ Wittenmyer, Gordon. "Cubs' Kris Bryant, Anthony Rizzo named NL All-Star reserves". Chicago Sun-Times. Retrieved July 8, 2015. ↑ Cosman, Ben. "Anthony Rizzo joins the ultra-exclusive 30 HBP/30 HR club". m.mlb.com. MLB.com. Retrieved October 8, 2015. ↑ Slonksnis, Catherine (July 5, 2016). "MLB All-Star Game 2016 rosters: Cubs, Red Sox dominate voting results". SB Nation. Retrieved August 16, 2016. ↑ "Rizzo Becomes First Cubs Lefty with 40-30 Season". chicagocubsonline.com. Chicago Cubs Online. Retrieved September 24, 2016. ↑ "Anthony Rizzo Finalist for Marvin Miller Man of the Year Award". chicagocubsonline.com. Chicago Cubs Online. Retrieved September 24, 2016. ↑ Muskat, Carrie. "Rizzo honored as Cubs' Clemente nominee". cubs.mlb.com. MLB.com. ↑ Muskat, Carrie (May 9, 2013). "Mom instrumental in Rizzo beating cancer". Major League Baseball. Retrieved 5 November 2016. ↑ Speier, Alex (March 16, 2010). "Red Sox wait anxiously for Westmoreland news". WEEI.com. Archived from the original on March 23, 2010. Wikimedia Commons has media related to Anthony Rizzo.